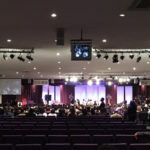 Yesterday I reported that Donald Trump spoke to a nearly empty black church in Detroit, based on a photo that one of the journalists who was in the room took from the back wall. Numerous Trump detractors celebrated my article, holding it up as further evidence that his attempt at connecting with African-Americans are continuing to fall comically flat. 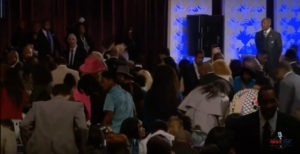 But last night a few of my readers pushed back against my reporting, instead pointing to videos which appeared to show the church having been packed full of people. So what’s the real story? But if you look more scrutinizingly, you realize that the video only depicts maybe the first seven rows of the church hall. When every inch of an image is consistent, eye tends to assume that what it sees within the camera’s view is representative of what’s just outside of it. And so by looking at the video, one might indeed assume Trump was speaking to a capacity crowd. In fact that’s what the creator of the video, Right Side Broadcasting, wants you assume. In fact its entire YouTube channel consists of videos of Donald Trump speeches labeled with superlatives such as “Amazing!” So it’s safe to say they wanted you to think that church hall was full. As it turns out, their videographer stood just behind the last row of people. Guess what the rest of the church hall looked like behind the video’s field of view? In other words the rows behind the pro-Trump videographer, which made up the bulk of the church hall, were completely empty. While I can’t make out Donald Trump in the picture, the Politico reporter stated via his Twitter account that Trump was taking the stage at the time he shot his photograph – and he would have no reason to lie about this. 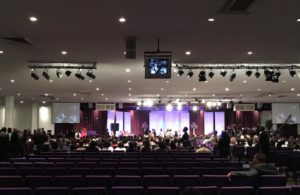 So Trump really did give a speech to a mostly empty black church. As it turns out, my reporting was correct. But I understand why some people might have fallen for the trickily shot video in question. The moral of the story: never assume that what you see within a video’s field of view is representative of what’s outside of it. And always check the motivations of your sources. While a YouTube channel from one of Trump’s own surrogates is willing to lie to you, a reporter from a respected site like Politico isn’t willing to risk his reputation by lying to you about something like how many people were in a room – and neither am I.